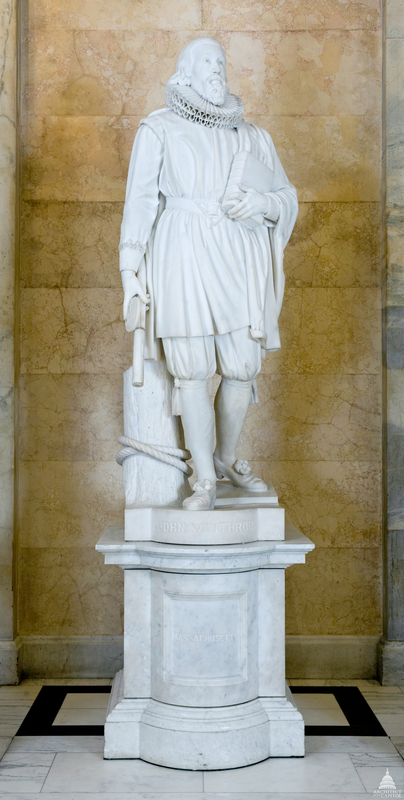 This statue of John Winthrop was given to the National Statuary Hall Collection by Massachusetts in 1876. John Winthrop was born in Suffolk County, England, on January 12, 1587 or 1588. He attended Trinity College, Cambridge, and was admitted to Gray's Inn in 1613. He practiced law in London and was admitted to the Inner Temple in 1628. Winthrop's Puritan convictions led him to take an interest in the new Massachusetts Bay Colony in the New World. His involvement in the planning and management of the corporation resulted in his being appointed governor of the colony in 1629. He left England the next year to take his new post in Massachusetts. Gifted in practical affairs and the art of government, Winthrop was the foremost political leader in the colony for nearly 20 years, including twelve non-consecutive terms as governor. Religious leaders were actively involved while the colony struggled to develop a form of government compatible with Puritan beliefs. Winthrop's views differed on occasion from those of the clergy; these disputes led to an eventual inquiry into dissension in the colony, with the result that Winthrop agreed to follow Puritan ideals more closely. At the same time, the colony had come under criticism in England. Winthrop successfully argued for its continuation in a letter to the Lords Commissioners for Plantations. In 1640 he held a post with the Court of Assistants, and in 1642 he was elected to the chief magistracy. In 1645, Winthrop was instrumental in forming the United Colonies and served as its first president. His contributions to Massachusetts continued until his death on March 26, 1649.